Anonymous I ordered 9 (small) shelves, thanks to a previous reviewer that stated the small size is perfect for your basic 10 by 6 hard cover books. yes, you do need to have a hard cover as the first book to work properly. Really easy to install. You don't need to drill into a wall stud, and if things seem unstable, just add some wall anchors and you'll be fine. Can hold about 9+ books depending on weight and size. This is a really great idea... modern... and cheap!!! lara88 I bought these since I had no available space in numerous bookcases. I put these (a total of 7 shelves) above my patio doors (also no room for curtains due to bookcases) and they are wonderful. Be aware if you buy the large shelf due to the fact that regular hardbacks are still to small. But this small shelf is great for hardbacks and trade paper books. The large shelf was available instore. The small shelf is PERFECT! Anonymous I bought these since I had no available space in numerous bookcases. I put these (a total of 7 shelves) above my patio doors (also no room for curtains due to bookcases) and they are wonderful. Be aware if you buy the large shelf due to the fact that regular hardbacks are still to small. But this small shelf is great for hardbacks and trade paper books. 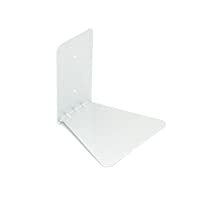 The large shelf was available instore. The small shelf is PERFECT! Anonymous These are truly outstanding -- have had 15 of them in use for 10 months in a library room that had no more room for freestanding shelves. Have had no problems with them -- they look terrific and get many, many compliments. Wish I'd thought of the idea on my own...Great price, great product. Anonymous I have so many books around the house, and so little room to have bookshelves on the floor. This is a wonderful idea! I have one shelf holding eight books, of coarse they are diffrent size and weight. If you have tons of books and little space, this is great! newsally These shelves are so easy to put up and inexpensive. They are great way to display books. They take up little space and look very neat and modern. They have proved to be a great conversation piece as well. Anonymous Friends try to figure it out! How are those books staying on the wall? I have eight smaller hardcover books on it, and it holds them up just fine. I'm online to buy more! RockabillyRiot I have several of these around my room, and I love them! They save space, and people are always impressed with how beautiful they look. These are so worth the price! issa1379 I love how it looks on my wall, and I love how my friends look at it while their trying to figure it out. So simple but so cool. Share this product and let your friends discover some cool new stuff!